The REVOLUTION® Floor Flood Feeder’s 14-inch diameter gives more feeding space per pan, plus you get the choice of a grill with 8 or 12 spokes. MILFORD, Indiana, U.S.A. — Building on the success of its REVOLUTION® Broiler Feeding System, Chore-Time recently introduced a floor flood feeder model with many of the advanced features found on its premium feeders. The Chore-Time REVOLUTION Floor Flood Feeder lets you add more comfort, performance and efficiency to your flood feeding program. The new REVOLUTION® Floor Flood Feeder offers the management simplicity of flood windows along with the feed conversion advantages and greater bird comfort offered by the entire REVOLUTION® Feeder Family, according to Dave Laurenz, Director of Sales and Marketing for Chore-Time. 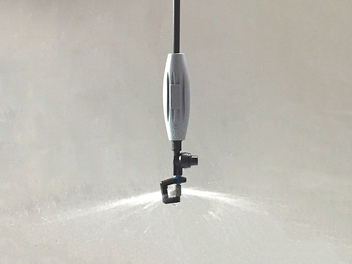 The REVOLUTION® Floor Flood Feeder adjusts to different management styles. Simply raise the feeders higher to close the flood windows as the birds grow or manually lock the windows into flood position at any pan height. Producers can also choose one of six grow-out feeding levels to optimize days to maturity or final market weights. The poultry feeder’s unique pan that is both deep and shallow works together with the feeder’s anti-rake fins and special grill design to keep more feed in the pan for birds to consume. Even small birds can conveniently help themselves to an abundant amount of feed from the pan’s perimeter while also keeping feed waste to a minimum. The REVOLUTION® is the only floor flood feeder with Chore-Time’s comfort grill. The unique scalloped pan edge and high-clearance grill naturally fit the rounded shape of young and growing birds to provide both comfort and easy feed access. The comfort grill has been shown to increase daily gains and enhance feed conversion in broiler flocks. 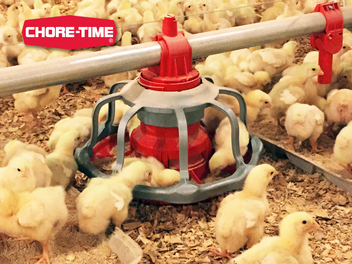 Chore-Time REVOLUTION® Floor Flood Feeders are available from independent distributors around the globe trained to design, install, service and warrant Chore-Time poultry feeding systems.